Here, You Can See How Much Cooler A Cool Roof Is than A Standard Dark Roof. Are you wanting to reduce your building utility costs? There are plenty of ways to make energy-saving choices in your home and business, but one of the best methods is to install cool roofing. During the summer, darker roofs can reach upwards of 150 degrees in 90 degree weather, but cool roofs can stay more than 50 degrees cooler! Our cool roofs in Texas, Louisiana, and Mississippi ,can deliver ongoing savings via lower energy costs. As a “green” roofing solution, they have a white surface which reflects 80-85% of the sun’s rays. In turn, it greatly lowers A/C costs, reduces the strain on HVAC equipment, and alleviates thermal stress on your roof structure. The type of cool roof you choose will determine greatly on the type of roof you would like to have. Components can be added to traditional asphalt and shingle roofs in order to make them cooler, or for flat roofs, yo can check out our cool roof coatings. No matter what type of roof you have, any type can be adjusted to be a cool roof. To learn how our cool roof coating systems can save you money, call us at (833) 200-0571. We’d be glad to schedule an appointment to look at your existing roof’s condition and its viability for a coating system, too. What's Special About Cool Roofing? Our Cool Roofs Effectively Reflect The Sun’s Rays! When one compares the performance of a cool, white roof with a dark roof, the differences are substantial. Via a cool roof coating system, you can change a dark or old roof into a cool, energy-saving asset! 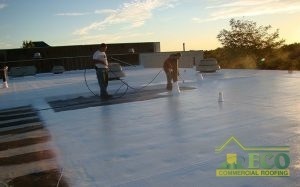 With a 20+ year background, ECO Commercial Roofing specializes in installing cool roofs with high-caliber results. You can count our team’s superior expertise and attention to detail! To schedule an appointment for a professional, on-site roof survey, or to learn more about cool roofs in Texas, Louisiana, and Mississippi, contact us today at (833) 200-0571!